During March, the average contiguous U.S. temperature was 46.2°F, 4.7°F above the 20th century average. Record and near-record warmth spanned the West and Great Plains, with below-average temperatures in the Northeast. The year-to-date contiguous U.S. average temperature was 40.3°F, 5.1°F above average. This was the second warmest January–March on record, behind the record of 41.4°F set in 2012. The March precipitation total was 2.56 inches, 0.05 inch above the 20th century average, and ranked near the middle of the 123-year period of record. Much-above-average precipitation across the Northwest offset much-below-average precipitation in the Southeast. Warm and windy conditions across the South created ideal wildfire conditions with over 2 million acres burning during March—a new record for the month. The year-to-date contiguous U.S. precipitation total was 8.09 inches, 1.13 inches above average. This ranked as the 10th wettest January–March on record and wettest since 1998. Most of the West, Great Plains, and parts of the Midwest and Southeast were warmer than average. Thirteen states were much warmer than average, with Colorado and New Mexico being record warm. The Colorado statewide average temperature was 42.5°F, 8.8°F above average, while the New Mexico temperature was 51.4°F, 7.9°F above average. Near- to below-average temperatures were observed across the Great Lakes and from the Mid-Atlantic to New England. The coldest temperatures, relative to average, were observed across New England. 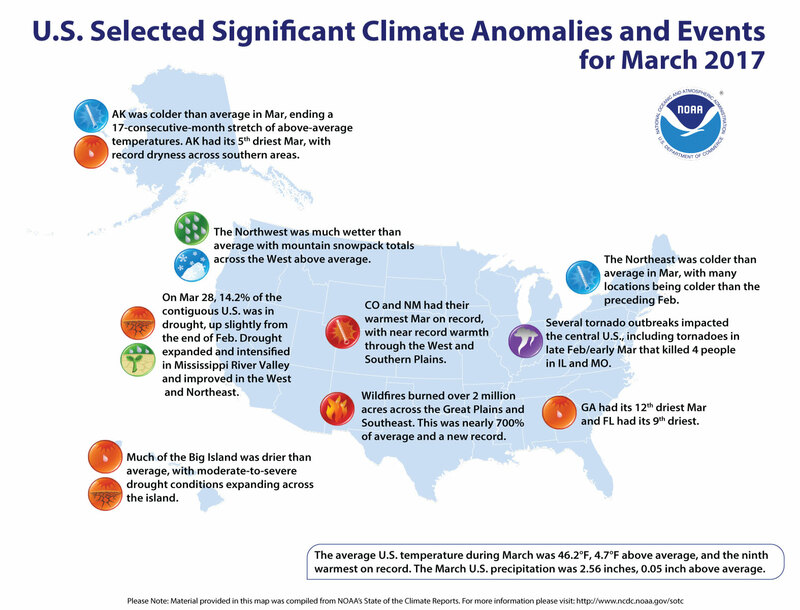 Following the record warm February in the Northeast, some locations had March temperatures that were colder than February—an unusual, but not unprecedented occurrence. The Alaska statewide average temperature was 4.1°F, 6.7°F below average. This was the 12th coldest March in the 93-year record for the state and coldest since 2007. This ended Alaska’s stretch of 17 consecutive months, beginning in October 2015, of an above-average statewide temperature. 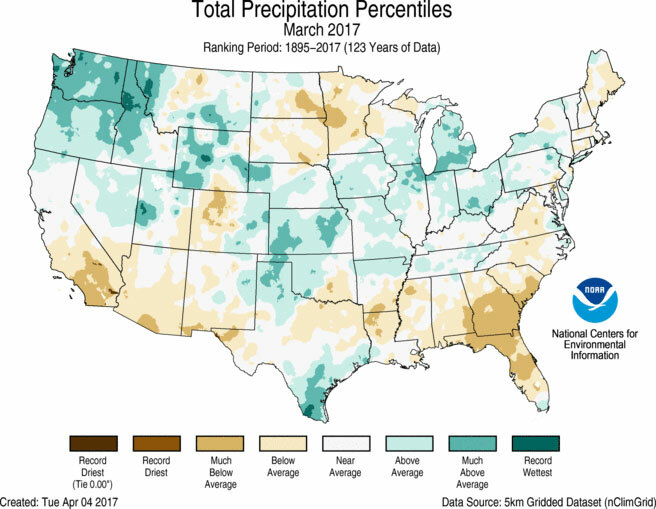 Locations from the Northwest through the Northern Rockies, Central Plains, and Midwest were wetter than average, with Idaho, Oregon, and Washington having much-above-average precipitation. The above-average precipitation in the Plains and Midwest was accompanied by severe weather outbreaks including damaging tornadoes. Abundant snowfall earlier in the season from California to the Central Rockies, combined with above-average March precipitation across the Northwest and Northern Rockies, resulted in above-average snowpack at most mountain locations on April 1. Below-average precipitation was observed in parts of the Southwest, Northern Plains, and along the East Coast. Florida and Georgia had much-below-average precipitation during March. Alaska had its fifth driest March on record with 1.16 inches of precipitation, 1.00 inch below average. Record dryness was observed across the southern parts of the state. According to the March 28 U.S. Drought Monitor report, 14.2 percent of the contiguous U.S. was in drought, up 0.1 percent compared to the end of February. Drought improved across some areas of the West, Mid-South, and Northeast. Drought conditions expanded on Hawaii’s Big Island. Drought conditions also developed and intensified across parts of the Central and Southern Plains and Southeast, where warm, windy and relatively dry conditions increased wildfire danger, with 2 million acres burning during the month. This was nearly seven times the 2000–2010 average and more than 600,000 acres above the previous record set in 2006. Above-average temperatures spanned the nation with only the Northwest being colder than average. 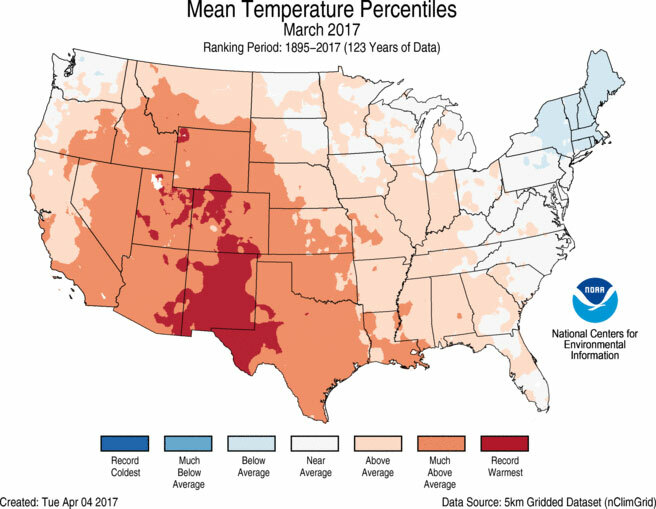 Thirty-eight states were much warmer than average during January–March with six states, stretching from the Southern Rockies to Southeast, record warm. 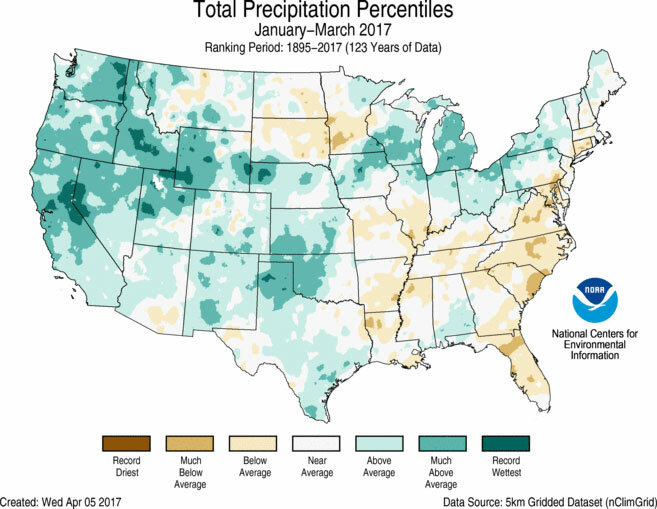 Above-average precipitation spanned most of the West into the Great Plains and Great Lakes. Seven Western states, in addition to Michigan, had year-to-date precipitation totals that were much above average. Below-average precipitation was observed for the Mid- and Lower-Mississippi River Valley and along the Southeast Coast. 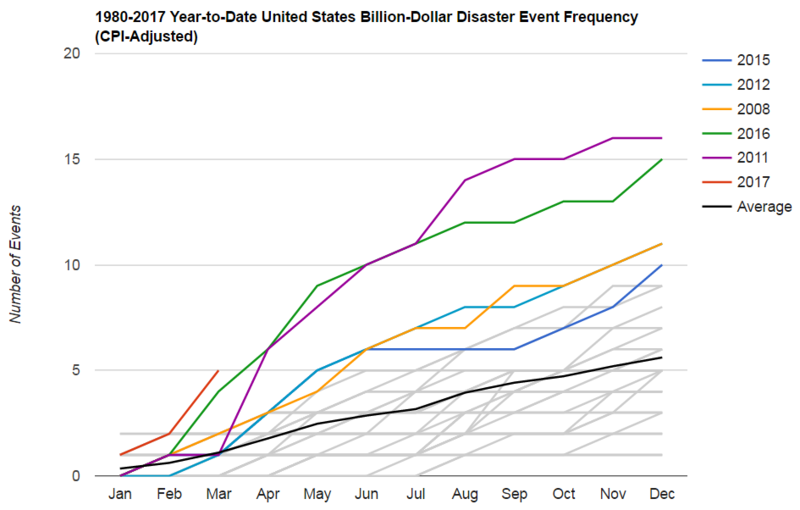 In the first three months of 2017 there have been five weather and climate disaster events with losses exceeding $1 billion each across the United States. These events included a flooding event, a freeze event, and three severe storm events collectively causing 37 fatalities. The U.S. Climate Extremes Index (USCEI) for the year-to-date was the highest value on record at more than double the average. On the national scale, extremes in warm daytime and nighttime temperatures, one-day precipitation totals, days with precipitation, and the spatial extent of drought were much above average. The USCEI is an index that tracks extremes (falling in the upper or lower 10 percent of the record) in temperature, precipitation, and drought across the contiguous United States. The full U.S. report will be released on April 11. The April 25–28, 2011 Tornado Super Outbreak caused roughly $11 billion in damages and claimed the lives of an estimated 321 people. A new study finds that one of California’s worst dry spells in 450 years has less than a one percent chance of recovering within two years. 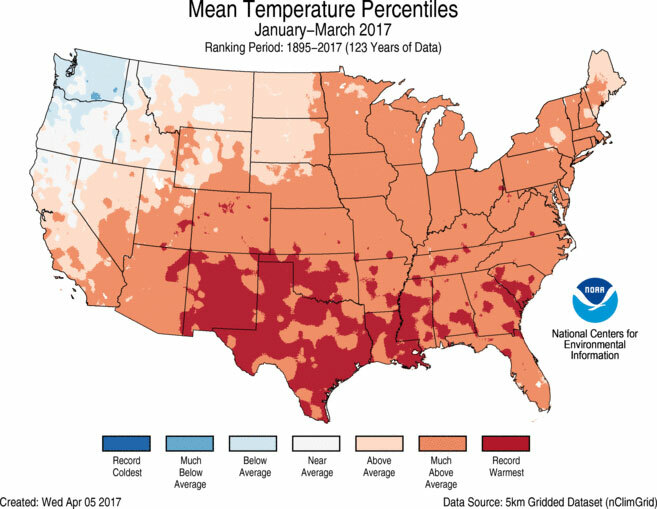 During April, the average contiguous U.S. temperature was 53.8°F—2.7°F above the 20th century average. During July 2018, the average contiguous U.S. temperature was 75.5°F, 1.9°F above the 20th century average.